I really liked the four principals, assured of their charm, whose gracious presence and confident vocalizing did the score proud. Handsomely costumed, they sang, sat and stood downstage front. The vast Komische Oper orchestra conducted by Koen Schoots were seated onstage behind them, and the huge KO chorus further upstage. 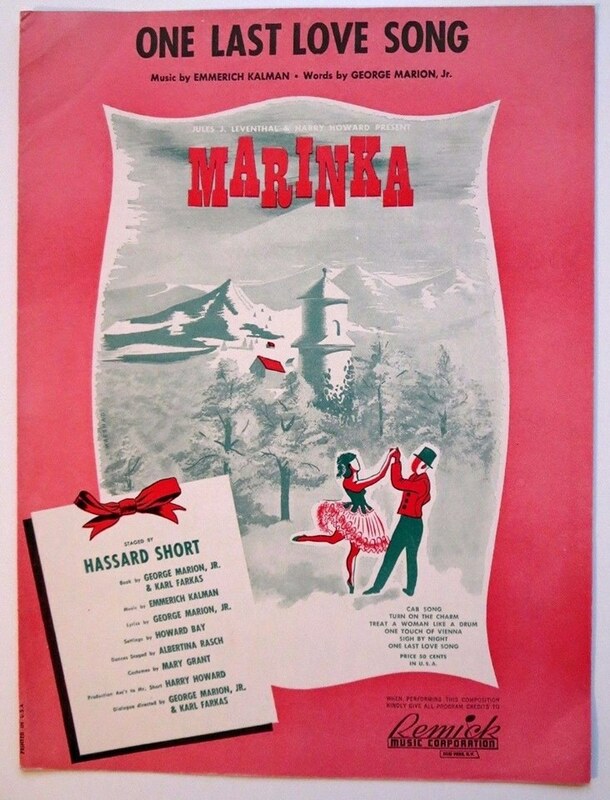 Director Barrie Kosky and his cast had made a conscious decision to camp up the performance, which genuinely entertained the audience even if it may not have been the Messrs. Shubert’s sentimental Marinka. Ruth Brauer-Kvam as Marinka was extravagantly flirtatious and funny, swooning and wilting in high melodramatic fashion. Having recently watched the US/UK series, The Crown, she bears an uncanny resemblance to a petite brunette Wallis Simpson. Unintentionally but effectively, this made me think of George VI’s abdication of the British crown for the woman he loves, which story neatly parallels that of Marinka. 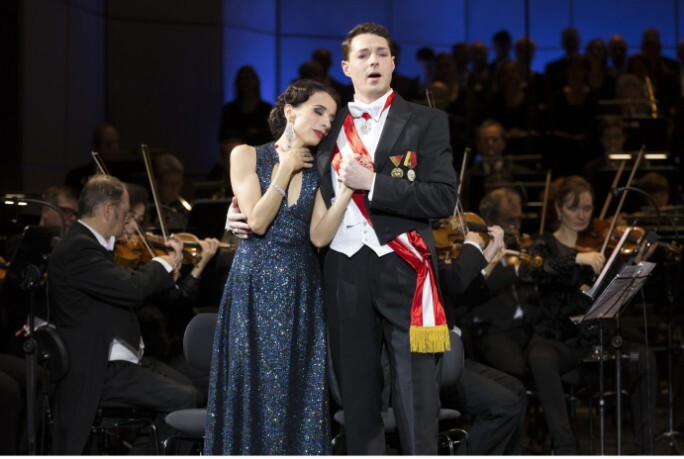 At the end of “Treat a Woman Like a Drum”, Brauer-Kvam broke character to toss an aside to the audience, “can you believe these misogynic lyrics, which era do you thing we’re in?” Johannes Dunz was perhaps a bit young as Kronprinz Rudolf, but he rose to the challenge well. With the bulk of the narration, a more mature Peter Bording dominated the proceedings somewhat as Bratfisch, great grandson of the coachman to Emperor Franz Josef. He has the comedy/charm songs, “The Cab Song,” “Turn on the Charm,” and “Old Man Danube.” (The latter an amusing spoof of “Old Man River” and the famous finishing cadenza from that song.) Tanya Lieberman had rather less to do as Gräfin Landowska, but looked sensational, and tore the house down with her big czardas and later comedy solo “(When I Auditioned for the Harem of the) Shah.” She gave it a very emancipated twist when she got to the part where the Shah auditioned for her! Insofar as the original orchestrations appear to have been lost, I really liked the new ones by Ferdinand von Seebach, lushly authentic in 1940s period, melodic, with the odd but welcome lapses into dance band style in the dance breaks, very Kálmán I suppose. Koen Schoot’s conducting sounded fine to me, but others thought it lacked imagination. My only criticism was that “The Cab Song” started too fast, and rather lacked the clip-clop rhythm I have grown accustomed to expect. I think that for a Berlin audience who all know the story of Rudolph, this concert was designed to show off the Kálmán score which it did well; American or British operetta fans might not know the story of Austria’s crown Prince Rudolph, who famously took his own life and that of his lover Baroness Marie Vetsera, rather than accede to his father’s wishes, in 1889. Marinka takes the well-known tragedy, and re-imagines a happy ending. Billed as “a romantic musical,” there wasn’t time for much genuine romance. Nor humor in the material, which must account for the confidently old-fashioned, out-sized performances which I admired. But I’m not certain that Berlin audiences appreciated the real humor of the idea of a former Hungarian prince and his lover moving to suburban Connecticut, living incognito, which I find both very funny, and oddly moving for 1945, after the devastation of WW2. So much for “lost in translation.” By the way, Wikipedia tells us that Marinka is the name of a small town in the contested eastern region of the Ukraine, current popualation of about 5,000. 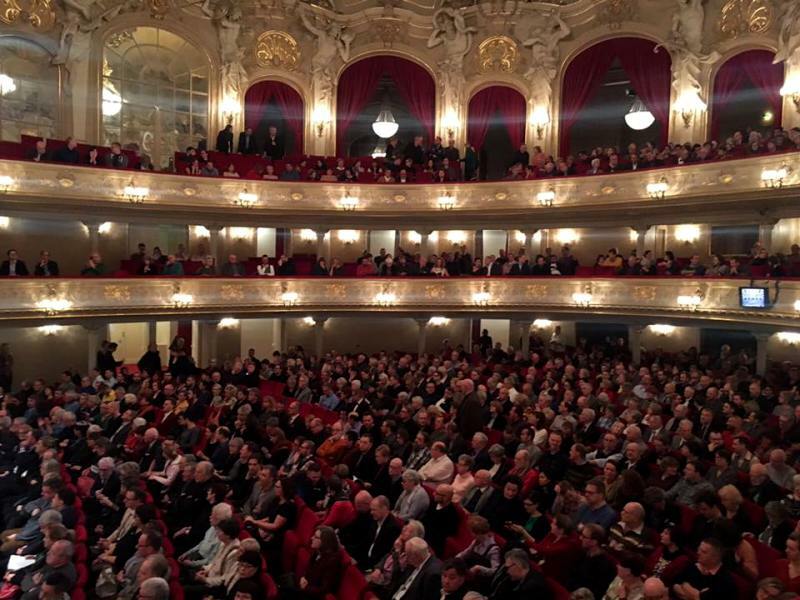 If one considers the risks in programming such an unknown work for only two performances at the Komische Oper, Marinka nonetheless played like a hit. 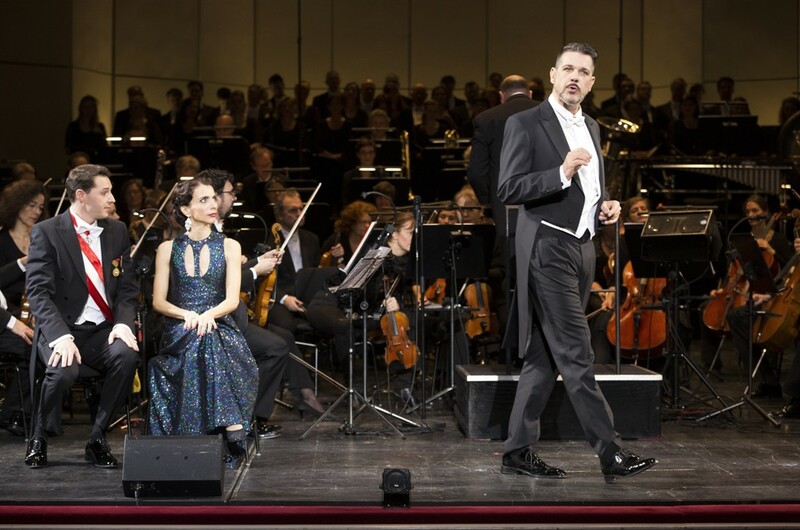 This bodes well for doing more concerts of lesser known operettas, since the audience seems open to them; kudos to Intendant [and Artistic Director] Barrie Kosky. 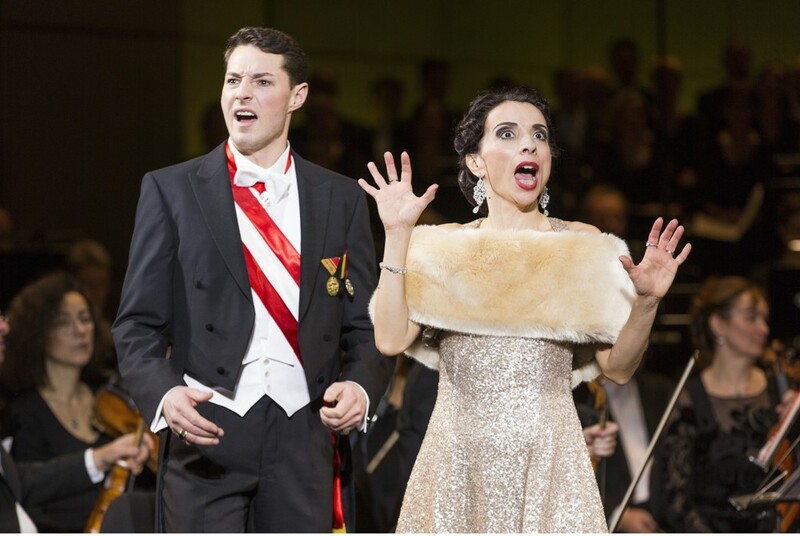 I cannot help but think that Emmerich Kálmán himself up in heaven must be looking down, smiling, as he hears Marinka performed, amazingly, at last in Berlin, some 72 years later.